Must have six months on the job training and/or work experience in a licensed child care center or comparable child care program. The Childcare Worker must be physically able to perform all the functions of caring for children including but not limited to; bathing, dressing, diapering, feeding and playing with infants and small children when working at our Nursery Facility for children ages 0-5. 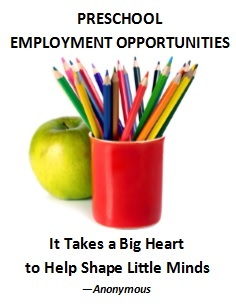 High School Diploma, at least 18 years of age and previous experience working with children. The ability to establish and maintain good relationships with volunteers, parents, and visitors to the facility. First aid and CPR certification and renewal when needed are required.